The pneumatic training systems from Rexroth consist of modular workstations with corresponding equipment sets where standard industry components are used with the "Snap-In" quick mounting system. For carrying out the practical exercises, Rexroth offers a variety of training systems for different topics like manually actuated pneumatics, electro-pneumatics and control technology. 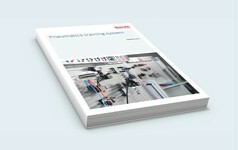 Get to know pneumatics with our training systems. The new WS200 training system impresses with its modular approach and practical compact design, as well as practice-oriented equipment and therefore offers perfect and low-cost access to the world of Rexroth knowledge. The WS200 is an introductory model with a wide range of add-on options depending on the use. The topics pneumatics and automation technology, as well as hydraulics, can be taught at the workstation. Topics like exam preparation according to PAL are also possible. On our proven EcoDesk and DS3 workstations, all topics can also be taught on larger work areas. The EcoDesk workstation can be used as a tabletop workstation. The DS3 workstation offers unlimited options for creating practical and demanding tasks in the fields of pneumatics, manual/pneumatic/electrical actuation, control technology in the field of pneumatics and automation. The practical exercises for the topics are covered via pneumatic components included in the equipment sets, any corresponding electrical interface connections and via the exercise books. The standard industrial components used in our equipment sets are the same as those that the students will use in systems and machines later in their professional life. For safe and practical use, the pneumatic components are equipped with a quick coupling system and a quick mounting system for a grooved plate.